I have to be honest, when the opportunity arose to review the Walkera RTF heli, I was nervous. Outside of a SIM, I have never flown a heli whether it be coaxial or not. 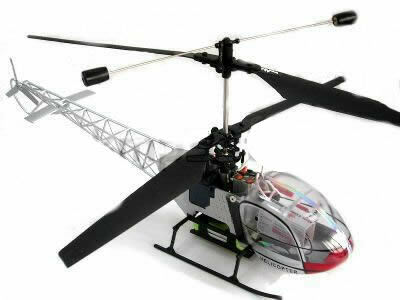 The Walkera RC-54 is a RTF coaxial helicopter and is said to be for the beginner. I can definitely test that! New 2005 Dragonfly 5 Ready To Fly Helicopter (pre-assembled). High Quality mixer with built-in gyro board. When they say RTF (ready to fly), they aren't joking. From the moment that I opened the box and pulled everything out, I realized there wasn't much to do. There is a balance rod that needs to be snapped to the top blade that softens the control inputs. Once that is put in place, it is down to charging up the included lithium battery and placing 8 double A's into the Transmitter. The included lithium battery slides into a tray on the undercarriage and uses JST connectors that are pre installed. The RX/ESC unit resides in the canopy compartment. The RX antenna is wrapped up and needs to be extended out to avoid interference. The included radio has a good feel to it and has a battery level indicator on the front for easy viewing. The battery compartment has a battery holder for four AA's on each side. I was pleased to see a JST connector on the battery holder. I happened to have an extra Transmitter battery laying around so I added a JST connector to match the polarity of the battery tray. The 600mah TX battery was a perfect fit. The 740 mah lithium pack is charged using the included AC adapter. It is a basic charger with no indication or safety measures. I have used it twice and it works well enough. However, I like to be able to see what capacity I use and what I put back in the pack, so I use my Triton charger. The battery slips into it's holder and with the TX turned on, it is connected to the RX. When I throttled up I noticed how smooth it was. The heli broke from the ground and I noticed it wanted to drift back and yaw to the right. I corrected that with the trims and it became almost hands off. This little thing can climb! It would shoot to the ceiling at full throttle, so I had to be careful. I had a blast for about 10 minutes point landing, spinning and navigating the stairways and doorways. It was precise enough and so easy to control, that I would walk around the house, through doorways and up a flight of stairs with the Walkera leading the way. It was too much fun. The battery began to get low and I began having a hard time maintaining lift. It was time to set it down and recharge. My boys love seeing this fly and have as much fun watching as I do flying. I even took it to the beach with us for my vacation flying fix. It was perfect! What an absolute blast! The Walkera RTF Helicopter is truly RTF and truly for the beginner. The quality is great and the build is basically non existent. From beginner to experienced, if you are looking for a heli that you can fly around the house for instant gratification, look no further. My only criticism is that the manual has no warnings regarding the lithium battery that is included with the kit. Although the charger is more or less fool proof, I often err on the side of caution.